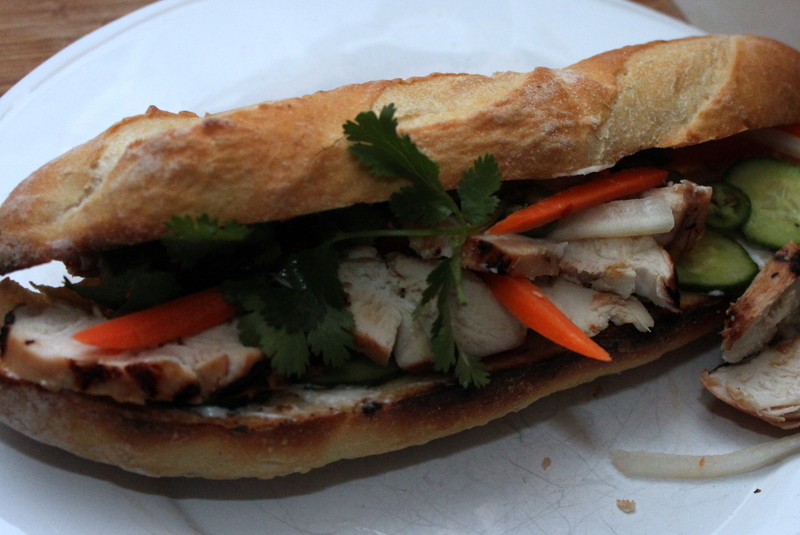 This recipe comes from Takeaway by Les Hunynh, and believe me, it’s a keeper. It took me about an hour to do all the chopping, slicing and juicing. I’d hoped for 30 minutes, but oh well. The end result was worth it. I said good night to Gabi, and then Jeff and I nearly scarfed down all of this salad. 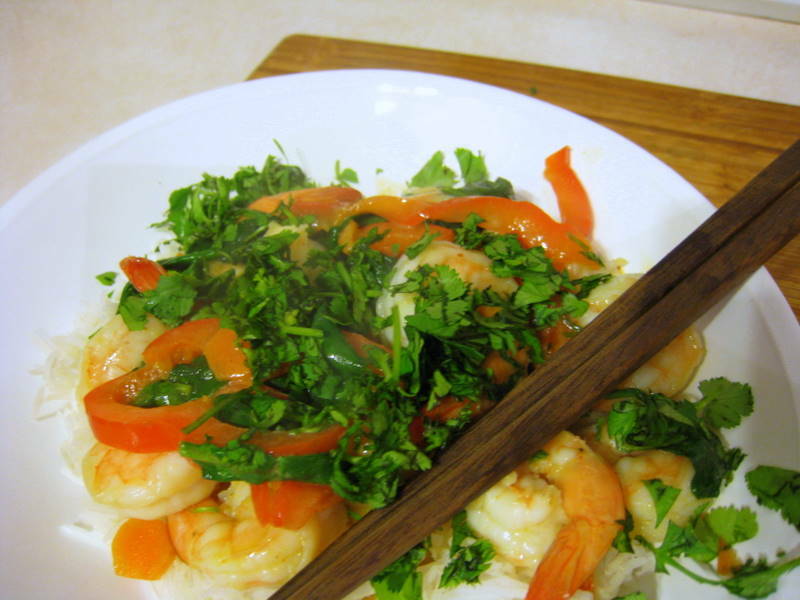 The combination of mint, cilantro, ginger, lime juice and fish sauce make it addictive. 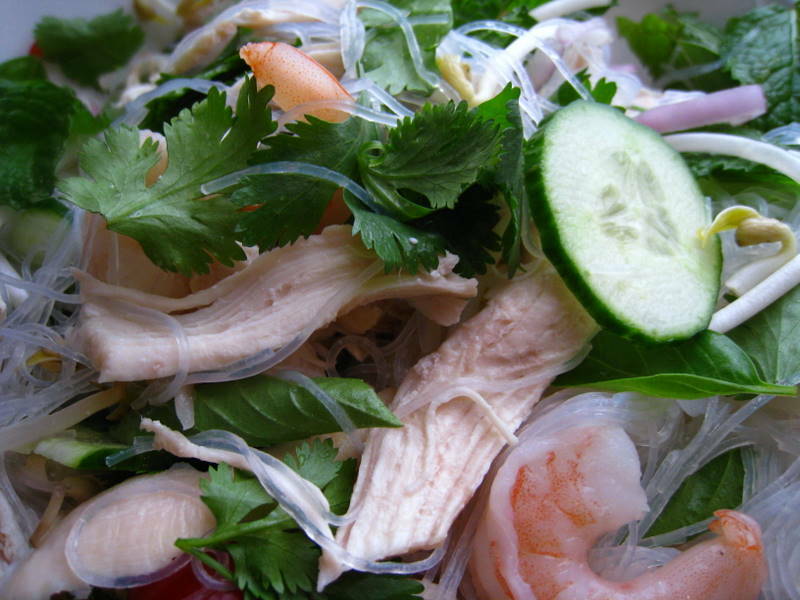 You won’t find anything better at a Vietnamese restaurant. Lime leaves can be found at international and Asian markets. I found them in the freezer section. If you can’t find them, by all means make this dish anyway. It will still be wonderful. Cabbage is served to the side. Heat the oil in a wok over high heat until smoking. Add the garlic and ork and stir-fry 3 to 4 minutes. Add 3 tablespoons water and simmer for about 2 minutes, or until the pork is cooked. Remove from the heat and leave to cool to room temperature. 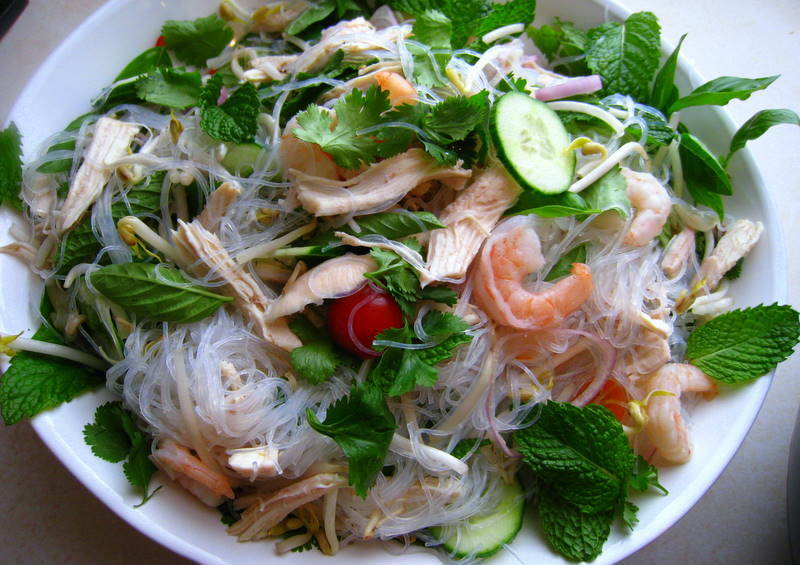 To make the salad, soak the vermicelli noodles in boiling water for 5 minutes, then drain well, Cut the noodles into shorter lengths using scissors. 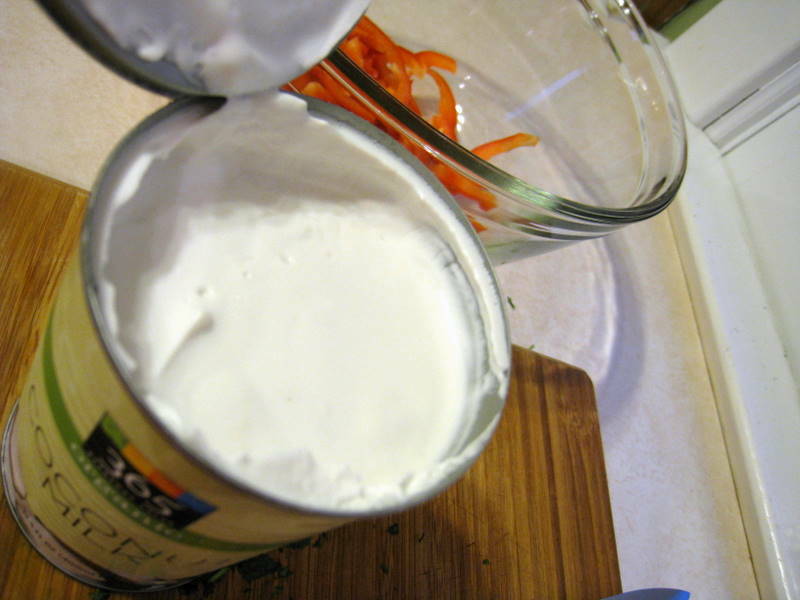 Combine all the dressing ingredients and stir until the sugar dissolves. 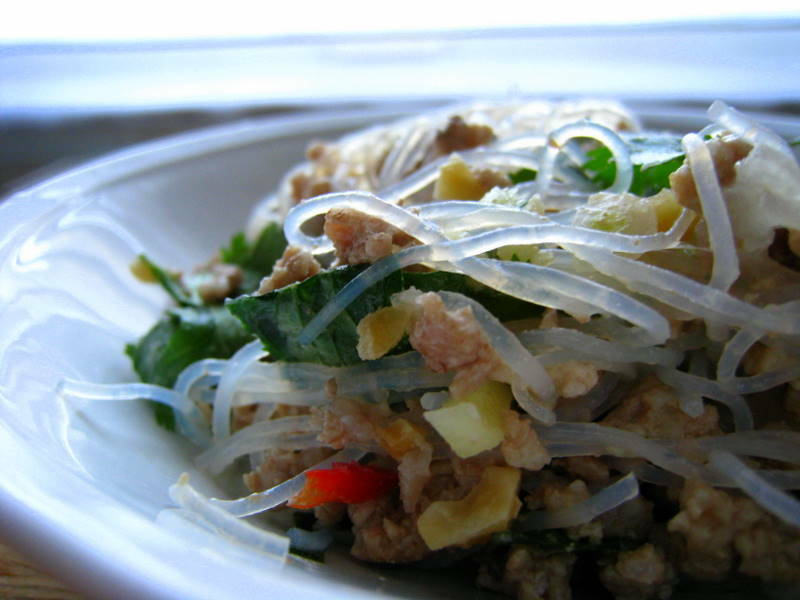 Combine the pork and noodles with the remaining salad ingredients, add sufficient dressing to moisten and gently mix. To serve, transfer the pork salad to a large serving bowl and serve accompanied with wedges of cabbage. This meal illustrates why I love to cook. It was a new recipe. I hoped it would satisfy a craving. And it did. On top of that, it was quick to make and required little effort. It filled the house with the smell of coconut milk and the warmth of red curry. The spinach, carrots and red pepper made it a beautiful meal. As far as taste? Delicious. About 10 years ago, I began exploring ingredients and cooking techniques while living in Little Rock, Ark. The city has a fantastic farmers’ market, one of the best I’ve seen anywhere. But it sorely lacks when it comes to ethnic restaurants. When I wanted Indian food, many times I ended up cooking it myself. The same went for Thai and Vietnamese cuisine. If only I’d found this recipe then. The quality of the curry paste you use could determine the degree of awesome-ness. I used red because I love it so. Red and green curry paste can be found in the international or Asian aisle of most supermarkets. If you live near an Asian or international market, see if they carry Mae Ploy. I highly recommend it. Spoon about 1/3 cup of thick coconut cream from top of coconut milk (set remaining coconut milk aside) into a large heavy skillet and cook over moderate heat, stirring, until slightly thickened, 2 to 3 minutes. Add curry paste and cook, whisking, for 1 minute. 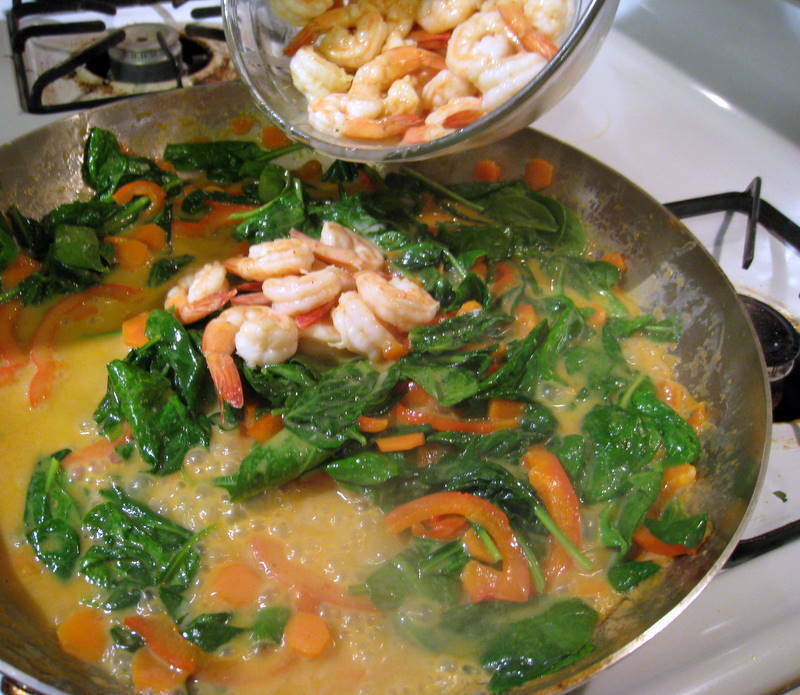 Add shrimp and cook over moderately high heat, stirring, until the begin to turn pink, 1 to 2 minutes. Add remaining coconut milk and fish sauce, bring to a summer, and simmer, uncovered, stirring occasionally, until shrimp are just cooked through, about 1 minute. Transfer shrimp with a slotted spoon to a bowl. Add carrots and bell pepper to sauce and simmer for 5 minutes. Add spinach tin batches, stirring until each batch is wilted. Return shrimp to skillet and simmer, stirring occasionally, for 1 minute. Sprinkle cilantro on the curry and serve with rice. Surely I’m not alone when I say this, but I’d never had turnip greens. Until today. I left our CSA pickup site this afternoon with a couple of bags filled with locally raised produce and meat. Among them: grass-feed beef, bok choy, strawberries and blueberry preserves. And turnip greens. I learned to love greens 10 years ago while living in Little Rock. Collards, kale and mustard greens are prolific in the South. They’re sooooo amazingly nutritious. But delicious? Yes, they can be. 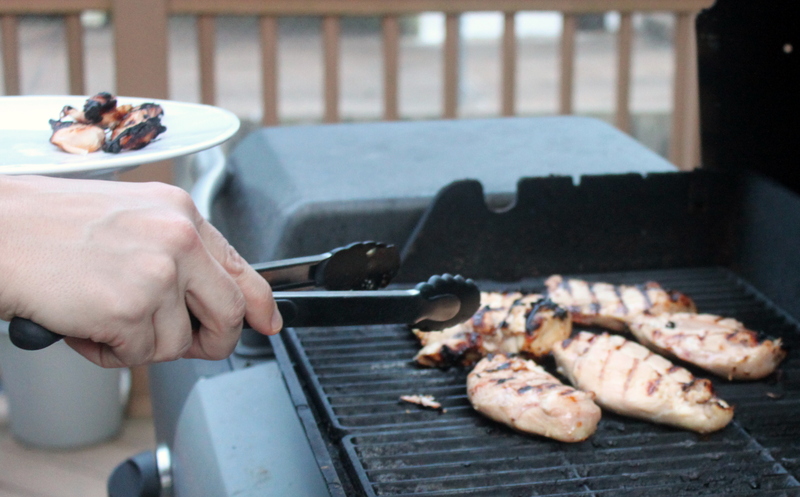 This recipe isn’t pork-seasoned, like a traditional southern dish. It’s filled with Asian flavor. If you haven’t tried bitter greens, give this recipe a whirl. 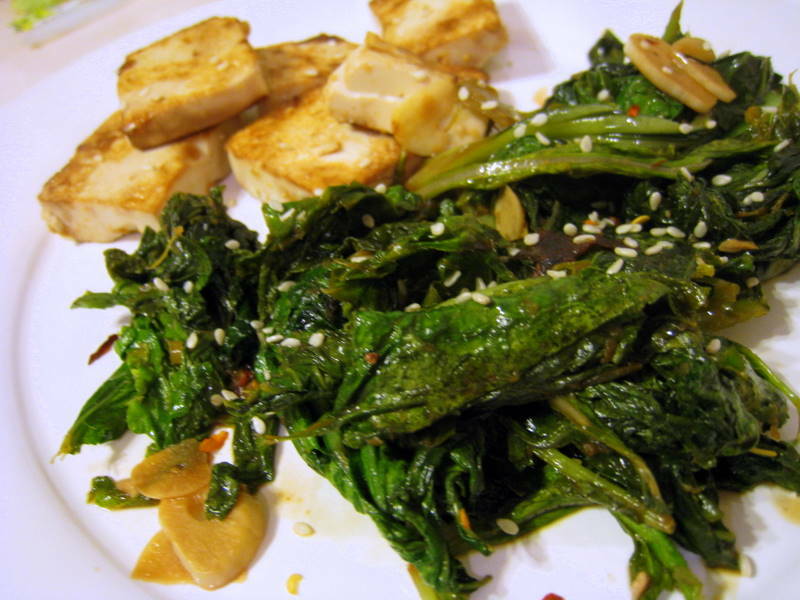 The combination of soy sauce, lime juice, ginger and garlic eliminates the bitterness of the greens. The tofu is soaked with the flavor. The greens quickly cook down to almost nothing. Be sure to use a full two pounds of greens. Anything less will leave you wanting more. 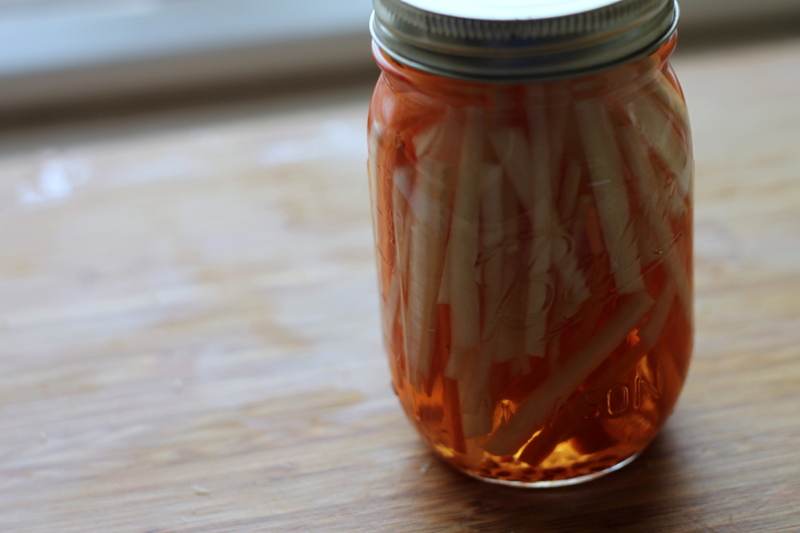 Jeff’s grandmother used to grow kohlrabi in her garden. I wish she were still alive so she could tell me how she used it. 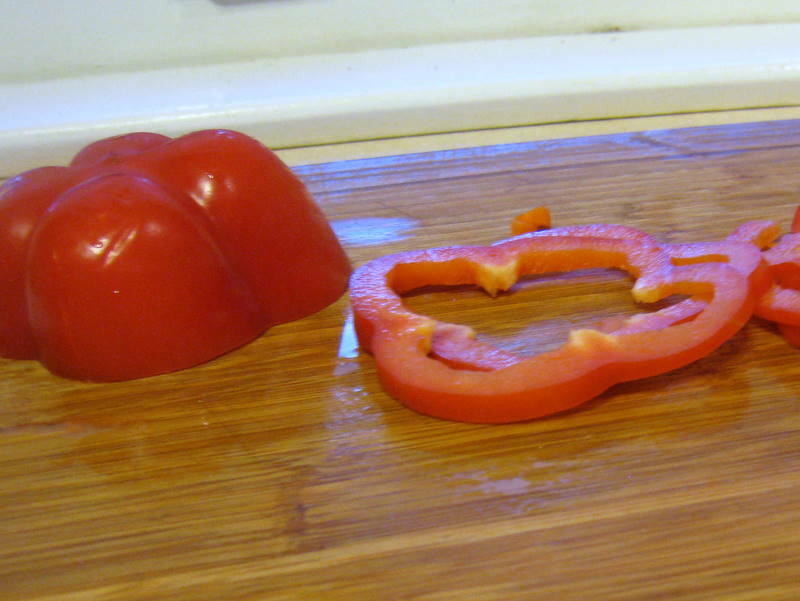 Somehow in the last two generations this odd-looking vegetable has gotten lost. After buying a few at the farmers market Saturday, I scoured my cookbooks and the internet looking for recipes. Have you ever seen these odd looking orbs at a grocery store? They’re just as hard to find online. It’s not that they taste bad. I sliced off a sliver and tasted it — sweet and mild, with a favor a bit like a broccoli stem, but crisp like an apple. 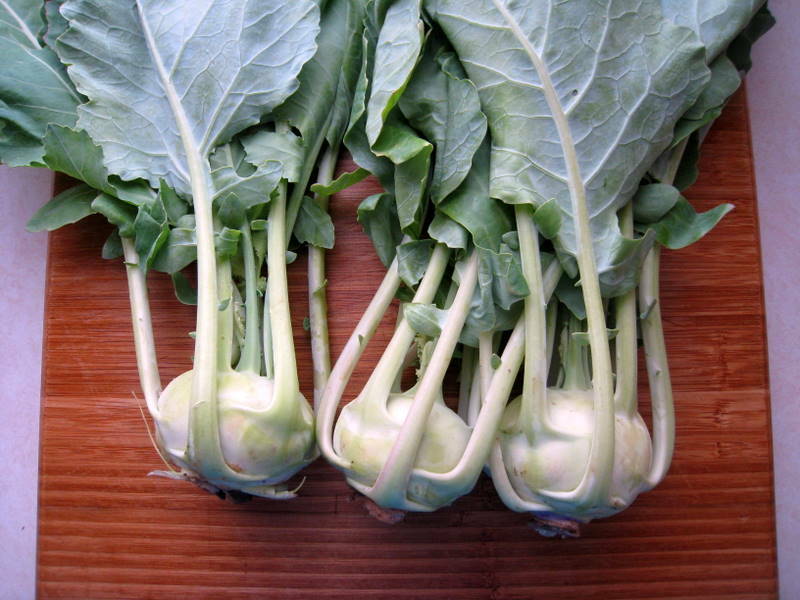 Kohlrabi are members of the turnip family. They’re used mostly in salads. Some people steam them. Stir-fried, they were great. Gabriella and I were at the store today and came across thick asparagus. 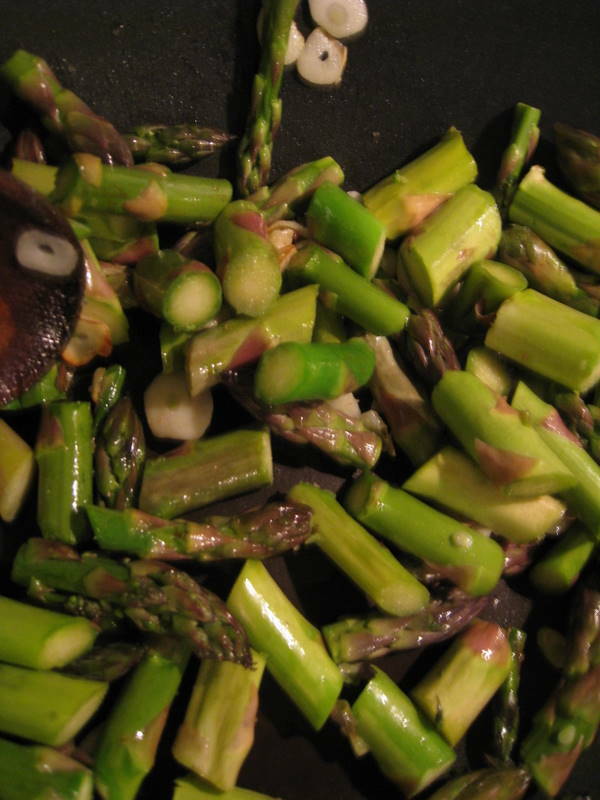 I used to only buy the slender spears, but the thick ones, when cooked right, have more flavor. They’re excellent in stir fries, for example. With this in mind, I snatched some up. A recipe in one of my favorite cookbooks — Gourmet Today — had been calling me.